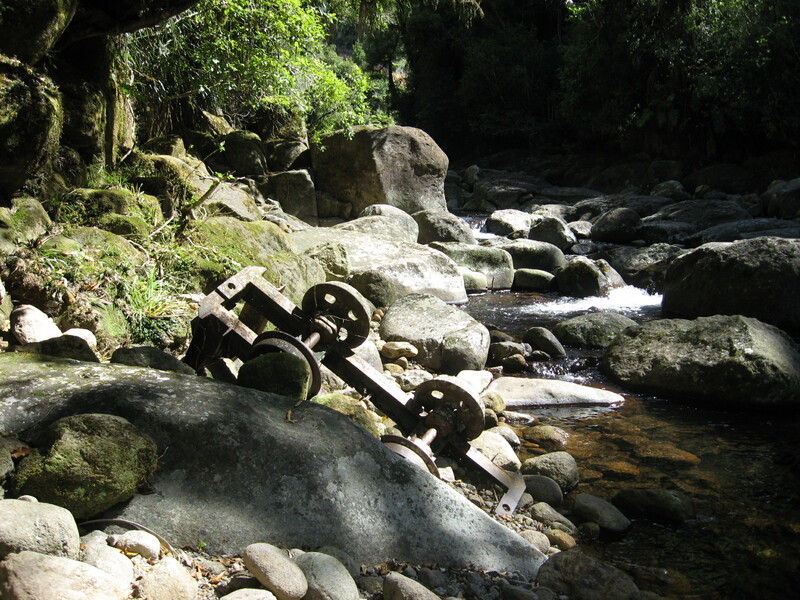 During this summer break, which is in the last week of January in New Zealand, I finally pushed ahead down the Ngatuhoa Steam and discovered the river junction, where the stream joint the the Opuaki River. During the summer months the water flow is limited, unless there is a downpour during a thunderstorm, and the riverbed provides, for most parts, a relatively easy path with breathtaking views of waterfalls, gullies and huge fallen trees. In a later post I will talk about that some more and show some of the photos I took. This post is about something I found washed down the stream, or simply dumped their. I was close to my destination in the river, when I spotted the remnants of a small rail car washed down the river, or simply dumped their after it had done its duty. My first thought was that it had been used in forestry or in mining, but there was no rail-track anywhere. I knew that in the ’80’s (or about) the Lower Kaimai Hydro-scheme was built. This involved the diversion of water from various steams to a sequence of relatively small power stations. This also involved tunnelling with tunnel boring equipment. In other parts, the ground was ‘difficult’ and tunnelling was carried out the old fashioned way. To carry away the soil and rocks dug out, a small, narrow rail line was built with rail cars and a small locomotive to pull them out. This system was used at the Opuaki intake no. 4 and the rail car I found was a remnant of that era. Next year I hope to go back and make some more photos with a better camera. No-trail tramping certainly has its advantages. You see a lot of things you know that not many people get to see. Doing it in my natural state gives it another dimension again.